Rebirth is a potent image for psychological growth. Many yoga practitioners are familiar with the lotus position, a classic meditation pose. Sitting with legs crossed, feet on opposing thighs, and hands cupped helps centers the body on one’s breathing, just as the petals of a lotus all link to the flower’s center. But the symbolism of a lotus goes deeper than that. The Indian sacred lotus, Nehumbo nucifera, is a pink perennial water flower. A many-layered wreath of lotus petals surrounds the cuplike seedpod. Throughout the day the flowers turn to face the sun as it moves across the southern sky. After sunset, the petals close into a tight bud before the lotus descends into the murky soil of the pond or river. The Sanskrit word for lotus, pankaja, has nothing to do with the flower’s color, scent, or beauty: it means “mud-born.” Although rooted in mire and nourished by decomposed matter, the lotus rises each day and opens radiantly into the light. 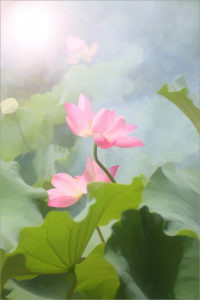 These qualities make the lotus an important symbol in Hindu and Buddhist art. Many images show the lotus seat or throne where Buddha and the bodhisattvas sit in meditation. The Akshobhya, or Buddha Imperturbable, sits on a lotus throne and touches the ground as his witness that the world of samsaras (birth, life, death, and rebirth) does not disturb him. To become immune to life’s challenges can take a lifetime of work. We are not separate from the earth. We grow from it and each day is a new beginning. All arises and passes away. Rebirth is a potent image for psychological growth. We must be willing to let go of parts of ourselves that do not serve us well. That might mean something as seemingly small as foregoing coffee in the afternoon so we sleep better at night, or as large as leaving a job or relationship that no longer fits who we are becoming. Growing into our fullness requires that we accept the mud from which we come.